Are leaders developing the wrong capability? New research suggests they may be. What we know from an array of research on trust is that trust impacts almost every measure of success in our professional and personal life. But just saying trust is important doesn’t cut it. We need to get more specific about trust and hold ourselves and others accountable for ensuring trust is a core value that is observable and applied through decisions and actions at every level of an organisation. First, we need to focus on our confidence for SELF-TRUST. This is an area most organisations ignore – at their peril. Without high self-trust across organisational employees and leaders, the other two core types of trust (trust in others, and earning others’ trust) become difficult, if not impossible to develop. The second type of trust is the courage required to TRUST IN OTHERS. This spiral of unintentional dis-trust in others has reached epidemic levels within the corporate world and one of the major causes of the increasingly reported levels of anxiety, stress and mental illness within organisations. 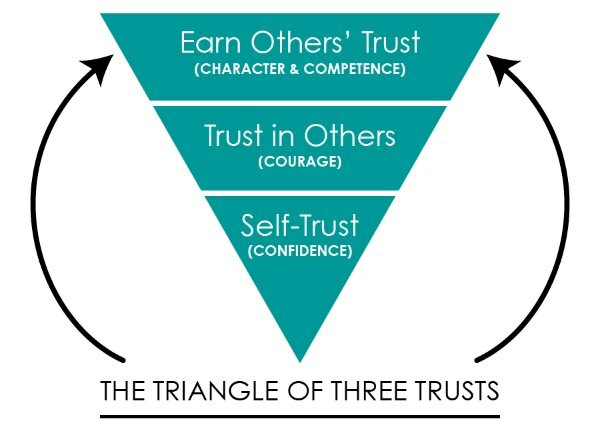 The third core type of trust is the combined character and competence to EARN OTHERS’ TRUST. This is where much of the corporate world is slowly coming to terms with as being core to their capacity to build a thriving organisation. 5. Hold everyone within the organisation accountable for points 1 to 4.